We promised ourselves that we would try for weekly or bi-weekly dates. Since our daughter pretty much refused a bottle until around 5 months old, we missed a lot of those dates. But you always wanted kids! And you work! You should be home with them when you're off. So, about that. No. I promised myself, long before even meeting my husband, that should I ever become a mother, I would first be a wife. 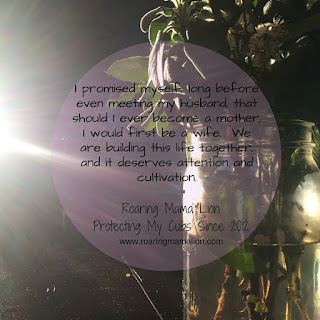 We are building this life together, and it deserves attention and cultivation. Also, there are some days when I need to have a conversation that is not interrupted by my son's sweet voice asking 1,000 questions about trucks and my daughter's little pig-tailed head bobbing up and down in front of me. Those moments are 97% of my not-at-work time. The other 3% can be with my husband. In the new year, we signed up for a babysitting service, and it's been great, mainly because of the whole guilt thing. I'm not calling in favors or promising to babysit in return. I'm paying a professional, whose source of income is based on watching children, to spend feed my kids, play with them, and get them to bed. No guilt. Even if you don't have the luxury, and it is a luxury, of a paid babysitting service, please, I beg you go on a date. Once you get over any lingering guilt about leaving your kiddos, you can jump into the joys of time spend just with your partner. Trust me. It's uh-mazing. Pick a vibrant location, somewhere you wouldn't take your kids - while your greatest desire may be to find a hotel and sleep, uninterrupted by the sound of a preschooler who needs to potty, an infant who shuns sleep, a sump releasing days worth of rain onto the street, and a toilet that inexplicable runs several times per night....oh, sorry, is that just me? Well, in any case, while your drive may be to just curl up in a corner and sleep, don't do it. Get out in the world like a real adult (or like the adult you were before you were a parent). Try a new restaurant. Go for a walk downtown. People watch. No movies - See #1. Put two sleep-deprived (like, I'm pretty sure I didn't even finish one REM cycle last night) adults in a dark room with comfy chairs and warm popcorn? Yeah, you might as well have gotten a hotel room. Talk about the kids - It's okay. You'll read advice about how you should do something where you're out with your partner not talking about the kids, and then all you can do is talk about your kids, and you'll start to feel all crumbly and weird, like you don't have anything to talk about. It'll be more awkward than a blind date with the totally not-right-for-you-dude your roommate set you up with in college because all she knew about you was "She's smart." (Oh, sorry, just me, again?). So, talk about your kids. Talk about your concerns. Tell funny stories. Talk about how proud you are that your little one is walking and your big one is learning how to hug his friends without knocking them over. And then, before you know it, you'll be talking about whether or not you both #feelthebern or how that one NPR story about the dangers of Daylight Savings Time rings oh-so-true in your house. Tell people you're on a date - Your friends, neighbors, random acquaintances, will ask where your kids are. You can either say, "Oh, shoot, did we leave them in the restaurant AGAIN?" or you can go ahead and brag a little bit. They'll look at you like you're crazy or be a little jealous. Either way, you get to have a little fun. Sneak back in - Assuming you're out past bedtime (the true bonus of date night - though to be fair, I do love the quiet cuddling, reading, and singing), you'll sneak in like a teenager in trouble, get the run down on the evening from the sitter, pay, and then sneak into your own bed. What you do from there is entirely up to you (and how well your kids sleep). Now, wasn't that fun? You should do it again. Right? RIGHT?